Discussion in 'Lexus Lounge' started by krew, Jul 20, 2015. 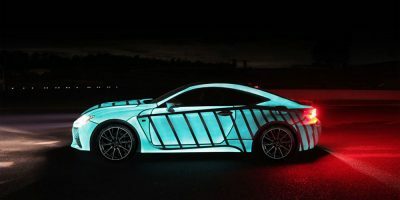 Lexus Australia has created an RC F that uses electroluminescent exterior paint to display the driver’s heartbeat. Wonder what that heartbeat would look like if the driver had a supermodel sitting next to him. CIF and krew like this. Did anyone else notice the car at the end of the video, new LS teaser? A new concept, another redesign, production version of concept? Nah mate, don't think so. Lexus Australia has been using that animation at the end of their videos for a while now. Whatever that concept is, it looks pretty cool.